I have finally added the real TA19 photograph to ETD, thanks to Dave Baldwin who sent me a copy which had the original typed list of names on it. So, perhaps, our old TA19 really was C52 Part 1? From Cliff White via John Vigar comes this picture of PTA1 – it’s their 50th Anniversary this year. Osborne J.F.V.P., James F.A.F., Lock R.C., Pulford R.C., Howse D.J., Cranefield D.H., Williams M.B., Brindley A.J., Bird P.
Thomas D.P., Tristem D.J., Gittins R.W., Hussey A.G., White C.J., Mead P.E.J. 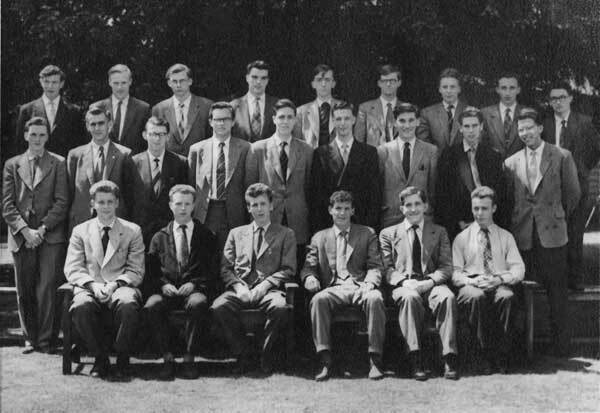 I am attaching a photograph of a group of young men who joined the BBC back in 1958. We were among the first ever school-leavers in this country who did not have to do National Service. Until then, the BBC always took on engineering staff who had a Services or University background, so we were the very first eighteen-year-olds to be employed by BBC Television. This happened on Monday 13th October 1958, when what became known as “Junior PTA Course Number One” were given a weeks introductory tour of all the engineering departments in London, then dispersed to London and the Regions to become pioneers (and guinea-pigs!) in the task of educating youngsters to the highest levels of BBC Engineering standards. this very first intake, and perhaps a little bit of sponsorship in arranging a date and a venue would be nice, too! In the first instance I would be grateful if you could publish this letter and photo in Ariel, Prospero, and on the Heritage website and then, depending on the response we get, we will take the project up to the next level.